It was an evening like this when I decided I would no longer suffer in silence in an abusive marriage and walked out on my husband. It was a decision that changed my life forever. Now I work as a gender volunteer for Women Action for Development (WAD) and I come across many stories like my own. I try to encourage these women to take that ultimate decision. I try to explain to them that their lives are too important to be wasted at the hands of someone else. Like me, my husband, Nobo Sharma, was a Meitei Brahmin. 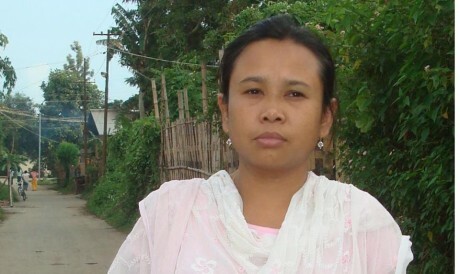 The Meitei people are the biggest community in the northeastern Indian state of Manipur. He was around 12 years older than me. His family and mine shared the same surname – Takhelchambam – and so we had the same clan lineage. This was reason enough for both our families to oppose us marrying as marriage within the same clan lineage is not traditionally allowed. My mother listed many other reasons for opposing the marriage – including the fact, he had been arrested many times for links with underground groups and he had been using drugs. We started living as man and wife without going through the traditional marriage rituals. I was around 20 years old then and in college. I never returned to my studies after that. We stayed in a rented room in Wangkhei area in Imphal East district, less than a kilometre from our families. He worked as a labourer and I hand-embroidered the borders of phanek, the sarong-like cloth that Meitei women traditionally wear. I also learnt to wash, starch and hand-stitch the gossamer-like upper cloth called Wangkhei phi worn by Meitei women on festive occasions. Between the two of us, we had enough to eat, but not so much that we could put any money aside. My first son was born in September 1995. When he turned around one year and eight months, my husband’s family sent word for us to come and stay with them, and so we went. We built a one room wattle and daub house in the front portion of the familial land but we were not asked to stay with them in the family home as a son and his family should be. They didn’t speak to us or accept us as family members. Soon after this, my husband stopped going to work. He also started drinking. At first it was occasionally, and then it was a daily ritual. He would force money from me to pay for his alcohol. As my second pregnancy advanced I could not work as much so we only ate when I could work. When I couldn’t work we went without food and our neighbours took turns to feed my elder son. My younger son was born in December 1998, around the time when Dingko Singh, a boxer from Manipur, won the boxing championships at the Asian Games. Traditionally, new mothers aren’t allowed to do any work for around 40 days, to give the body the rest it needs to mend. But 22 days after the birth, I was up and working again, washing clothes and starching them in loads, the infant tied on my back and pushing my body to its limits. I was providing for the whole family – buying milk supplements for the baby, food for the family, and clothes for the children. My husband would often drink until he passed out and I would have to go and fetch him. He would promise to change but he would quickly forget his promises and started drinking again. His family blamed me for his drinking and quarrelsome nature. Around the time my younger child reached his first birthday our house collapsed. We partitioned off a corner of the mandap [porch] in front of his familial temple and lived there. The corrugated iron sheets from our collapsed house were stacked in a corner, and soon my husband started selling them off in ones and twos to pay for his liquor. One day we literally had a tug-of-war over one of these sheets and ended up in a blazing row. Suddenly, I decided that I had had enough. I packed a few clothes, gathered my children and went to my mother’s house. I never returned. My husband was diagnosed as HIV positive a few years after I walked out on him. He died soon after. The fears I had; the discrimination both he and I endured at that time when his status came public, and how I tried my best to help him even though our marriage had ended, that is another story. Nevertheless I can’t help wondering what would have happened to me and my children if I hadn’t had the courage to walk out that evening.